Tiffany's Online Finds and Deals: Enter to Win this cool Baby Spoon Set! Gleam Giveaway ENDS 1/30! Enter to Win this cool Baby Spoon Set! Gleam Giveaway ENDS 1/30! And the time has finally come to introduce your baby to solids! Why do you need special spoons when you have a kitchen full of them, you may wonder? Because typical teaspoons in your kitchen cabinet are too deep for your baby, and using them will only make the whole weaning process more frustrating. The wrong spoon will not only make eating difficult, it can even injure your baby’s delicate mouth. This Pack of 2 M KITCHEN WORLD Baby Training Spoons are all you need to help introduce baby to solids, and encourage self-feeding. 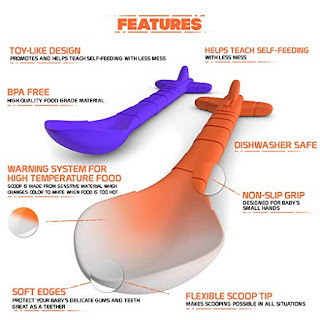 Made with 100% toxin-free, food-grade BPA, lead, phthalate and plastic free silicone, the spoons come in two colors (orange and blue) and a cute airplane design, making them perfect for fussy babies and toddlers. These first stage feeding spoons have soft tips and are extremely gentle on baby’s gums and teeth, and can be used as teethers as well. What is unique and innovative about these training spoons is the warning system that will alert you if the food is too hot. The scoop is made from a sensitive material that changes color to white when the food temperature is too high, preventing any unpleasant situations and making feeding a easy and safe. The baby spoons come with an ergonomically designed non-slip handle that fits both adult and baby hands. The spoons are dishwasher safe and easy to clean, just what a busy mom needs! The Baby Spoons come in a great beautiful package, making it the perfect baby shower gift! FOOD GRADE SILICONE, GENTLE ON BABY’S GUMS: Made with 100% toxin-free, food-grade BPA, lead, phthalate and plastic free silicone, hypoallergenic and ultra-soft to protect baby’s gums and teeth. WARNING SYSTEM FOR HIGH TEMPERATURE FOOD: Scoop is made from sensitive material which changes color to white when food is too hot. TOY-LIKE DESIGN: Carefully designed to help introduce baby to solids, encourage baby to learn self-feeding and master fine motor skills. FLEXIBLE SCOOP TIP WITH THE RIGHT DEPTH: The shallow spoon design prevents baby from scooping too much food at once, reducing the risk of choking. ERGONOMIC HANDLE: Perfect for both baby’s and parents’ hands, making feeding easy at any angle. I would love these for my patient! I think these are so cute. I think any kid would love these. This set would be great for my grandson! He just started solid food yesterday. I'll be needing these soon with my baby girl! These would be perfect for my 5 month old great granddaughter. She just starting eating foods! Would love to win these for our first grandbaby on the way. Wow, these are cool! They are great for meal time, and you don't have to guess if it will be cool enough for baby no more! Very cute set. I wish I had these when my son was younger. They'd be great for my nephew though. hmm, let's see if commenting works this time. Woul gift to the neighbor whose babe just started eating OR end up with my kids.. Yes, very well liked, Very nice.